I don’t care what you believe. Just believe in it. Do we always believe in something? Theorists of secularization have to witness how religion is not dead in our society. Internet testifies that religions are still alive through a proliferation of websites dedicated to new and traditional religious groups. It might be that people do not engage in religion in traditional spaces as much as they did in the past, but there are still places of religious interaction both offline and online. What exactly is the relationship between religiosity and beliefs? Is it possible to believe without belonging to a religious group in this period of shifting religious authorities and new religious groups? Surely, there is a general decline in religious authority, as people are freer to seek the form of spirituality they prefer. This is no news since Peter Berger’s idea of ‘Spiritual Supermarket’, where people can put in their spiritual ‘cart’ a multitude of practices from different religions. But at the same time, some kinds of religious authorities are emerging and becoming popular in today’s society. The results of the recent survey in Italy, Macchianera Award, showed that the most popular web character in 2013 was Pope Francis. 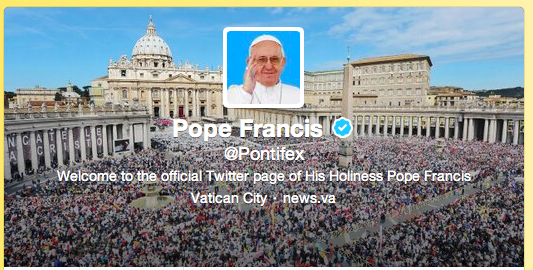 Heir of Benedict XVI’s Twitter account, Pope Francis was able to engage with the web in a way that made it possible to create a new space of interaction with people worldwide. In Italy there is a general decrease in church attendance, but Pope Francis’s Internet fandom seems to decree that people still believe in the Catholic Church, or at least they do engage with it. Pope Francis is an example of the revival of traditional religious authority, even through unconventional spaces and approaches. However, the Internet engages not only with mainstream religious authorities, but also unveils a great amount of new religious movements. Sometimes criticized as ‘dangerous’ or able to ‘brainwash’ members, many new religious groups are actually meeting people’s need to believe in something without belonging to a traditional religion. A strong example of an Internet group dedicated to new spiritualties can be found in Wichvox.com, a website that puts together links and communities of Wiccans and Neo-Pagans. Generally based on ancient pre-Christian traditions, Neo-Paganism is a non-codified religion that had a great revival in the last decades, thanks also to the power of the Internet. Many Neo-Pagan groups on the web link together people that are geographically distant and provide alternative spiritualties from the mainstream religious organizations. In this scenario of changing religions practices and beliefs, there are people that choose not to believe in any god. But does the absence of god mean that one does not believe in anything? Internet saw a proliferation of non-conventional religious groups, but also groups that somehow reproduce religious structures without claiming the authority of one or more gods. Many yoga groups, both offline and online, constitute places of people’s interaction and, sometimes, they lead their members to make substantial life-choices and changes. Most yoga schools and organizations, like the Yoga Alliance, do not claim any religious background, but they do involve spirituality. Similarly, groups of self-help or life-coaching, like The Power of Purpose, ask their members to focus on the improvement of their life. Is it possible to define these groups as religious? Strictly speaking, members generally do not perceive themselves as part of a religious group. However, according to anthropologist Clifford Geertz’s well-known definition, a religion is “(1) a system of symbols (2) which acts to establish powerful, pervasive and long-lasting moods and motivations in men (3) by formulating conceptions of a general order of existence and (4) clothing these conceptions with such an aura of factuality that (5) the moods and motivations seem uniquely realistic.” Following this framework, even yoga groups or self-esteem groups could fall into the definition of religion. As well as groups that create around celebrities or sports. More important, people that engage in these activities probably do believe in the principles of the group. They might not believe in a god, but they do practice something that for them is meaningful. Probably human beings do not necessarily have to believe in a god. Atheist activities show that in our increasingly fragmented and liberal society more and more people decide to come out declaring that they can easily live without a god. But believing is not necessarily the belief in a god. Human necessities do not contemplate a god, but it is normal for human beings to make sense of the reality around them and engage in the creation of meanings they believe in. Traditional and new religious groups, yoga and self-help groups, atheist groups, fandom groups for singers or actors: they all show the natural tendency for people with similar beliefs to come together and do practices that are conformed to what they believe in. Internet enhanced this characteristic of human nature, since now it is easier to create and participate in online communities. Different Third Spaces are created around human beliefs and evolve in new meanings for our society. Do we always believe in something? People increasingly choose not to believe in any traditional god anymore. However, they start to follow new gods, new paths of spiritualties, new ways of aggregation with other people. People choose to believe that there is no god; that’s a powerful form of believing as well, since it is a way to engage in a resistant movement creating new values and structures that are not the traditional ones. Traditional religious authorities may decline, but religious-like associations and groups, both online and offline, will probably endure in our society because they respond to the human need of coming together, create meanings, and propagate the values they believe in.